I'm still trying to get my head around the fact that Manchester United's star winger, Cristiano Ronaldo IS truly REALLY - it's no joke this time - LEAVING the club for the glam footballer realm of Real Madrid. Geez, just what that club needs, another massive ego. I think they might need a larger dressing room. It was fun while it lasted. And I have to offer a big heartfelt thanks for all that Cris did while a Red Devil. Now he can do step-overs into the Spanish sunset to his heart's content. 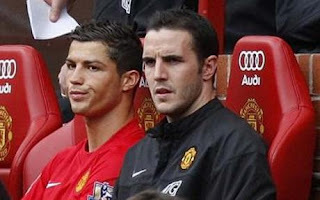 Best of luck with Real - although, really I can't see you doing much better than you had done in Manchester, Cris. United will survive -- they always do! One player does not make THIS team.